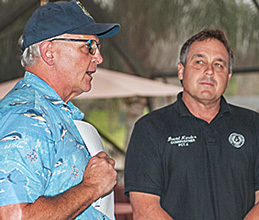 << Brazoria County Commissioners Dude Payne and David Linder delivered some much anticipated good news at the "State of the River" meeting about reopening the mouth. Commissioner Toby Baker serves as Governor Abbott's appointee to the Gulf Coast Ecosystem Restoration Council. Read his 15Feb2017 letter to State Representative Dennis Bonnen announcing the list of projects for consideration to receive RESTORE funds. Note: Page 1 of the list is shown below. The complete list accompanies Commissioner Baker's letter. One hundred and six attendees cheered as Commissioners Dude Payne and David Linder reported at the annual FOR "State of the River" meeting Sat Feb 18th that the project to open the mouth of the river has been included in the list of projects (see below) the state will submit to the U.S. Treasury for funding from monies coming from the Deepwater Horizon settlement. Commissioner Payne clarified that this is not a "short list" to be pared down further, but rather the complete list of projects the state intends to pursue with its $66M share of the state discretionary or "Pot 1" funds from the RESTORE Act. 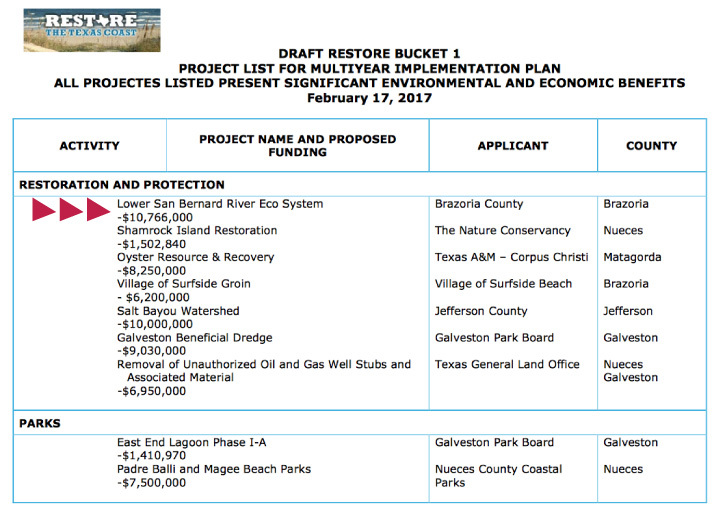 The $10.766M project to open the mouth is part of $27.5M allocated to three Brazoria County projects, one Matagorda County project, and one shared project. The next two hurdles for opening the mouth are approval of the permit to dredge and final approval from the Treasury to fund it. The Treasury is still developing its process to formally apply for the funds, but a 45 day public comment period is opening soon. We'll let you know as soon as that period begins, and we ask everyone to please access the site using the link when available and lend your support to the project to open the mouth of the San Bernard. Final approval and start of dredging may still be a long way off, but it's looking better than ever that it's a matter of when and not if. Stay tuned for further information as it happens!